Psy-Warriors explores the military use of psychological operations as writer David Leland poses “the moral dilemma [of] how far we can torture and degrade prisoners in the name of democracy and freedom” (Radio Times). It unflinchingly depicts the physical and mental treatment of terrorist suspects, drawing from official reports and research. Images of the practices of humiliation and interrogation are troubling – The Listener’s David Wheeler called it a “sado-masochist’s special” – but so are the concepts behind those practices, which are explored in provocative yet witty dialogue. 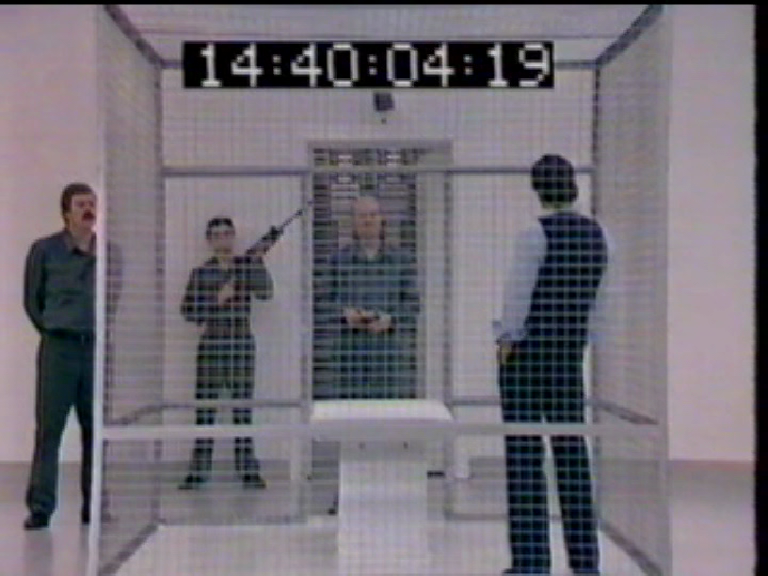 Apart from a few filmed inserts, Psy-Warriors was shot on video in the studio and, in director Alan Clarke’s characteristically passionate and precise handling, the dramatic spaces of television reinforce the play’s ideas. The play’s revelation of the reality behind the three suspects’ involvement advances its controversial views on military and terrorist psychology, culminating in moments such as the analysis of real footage of an act of killing and Northey (the superb Colin Blakely)’s statements on the motivations for, and solutions to, Palestinian violence. The academic study Televising ‘Terrorism’ in 1983 singled out Psy-Warriors as a more open analysis of terrorism than in much drama and news coverage. 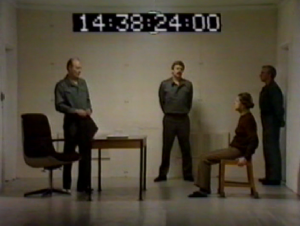 However, some critics and viewers saw it as “IRA propaganda”, given its timing: it was broadcast on 12 May 1981, the night that hunger striker Francis Hughes died and one week after the death of Bobby Sands. Mindful of controversy, BBC1 had moved Psy-Warriors from Play for Today’s 9.25pm slot to 10.20pm. Today, its comments on ideology, the language of the “war on terrorism”, the depiction of naked, hooded detainees and Leland’s concern that “We pollute our own purposes by maltreating victims” (Radio Times) have gained new relevance from recent events, our familiarity with images from Abu Ghraib and the interrogation of those images in Standard Operating Procedure (2008). Clarke often used studio space inventively – see Danton’s Death (1978) and Baal (1982) – but Psy-Warriors is particularly distinctive, exploiting the potential for minimalism that has been discussed elsewhere in this BFI Dramatic Spaces season. Largely static shots reveal various spaces. Sparsely furnished rooms are shot from side-on, formally and at times symmetrically. 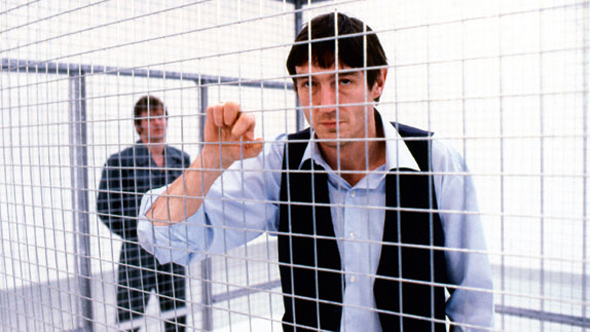 Dark spaces of sensory deprivation are shot from above, contrasting with the bright white, harshly-lit spaces (Richards (Derrick O’ Connor) wryly wonders about the electricity bill) in which suspects are seen through the foregrounded intersecting lines of cages. Some compositions and staging are formally theatrical – Wheeler thought it took place in a ‘Playwrights’ Limbo’ – but the use of lenses, framing and cutting between similar rooms disorientates our sense of space. Knowledge constitutes or hides power in this play, and we’re always aware of the position from which we ourselves look, know or “choose not to know”. This concern with the geometry of space, lines and the discourses of terrorism reaches a climax in Clarke and Danny Boyle’s devastating Elephant (1989). Psy-Warriors also reminds us not to accept the received wisdom that television drama’s movement towards cinema was inevitable or inherently positive. BBC head of plays Keith Williams observed in 1982 that, although the BBC had to respond to Channel Four’s recent investment in film, it was committed to studio, investing in equipment, buildings and staff (The Stage and Television Today). Using “new energy and imagination”, the BBC would bring “innovation to the use of studio” and “carry drama forward”. Psy-Warriors, Williams said, created a space rather than photographing a stage: “The television play lies somewhere in that direction”. This was not an accurate prediction but it shows the achievement of Psy-Warriors and the potential of the imaginative world of the studio. Like Psy-Warriors, The Saliva Milkshake has Rosalind Ayres and Julian Curry in its cast, examines terrorism and the state’s complex relationship with it and language surrounding it, and makes distinctively minimalistic use of the television studio. However, writer Howard Brenton and director Robert Knights raise different questions in their handling of theme and style. Increasingly successful liberal intellectual Martin (Michael Harbour) examines his own loyalties and capacity for commitment when old college friend Joan, remembering him as a revolutionary socialist, confesses to a political assassination, while the Establishment has its own demands and powers. Studio space gives us a subjective sense of Martin’s dilemmas and world-view, not just in his monologue to-camera but in his triggering of movements in space and time. 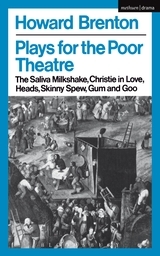 This use of studio space is theatrical in its use of minimalistic sets in black cyclorama, audience address and lighting changes, and The Saliva Milkshake became one of Howard Brenton’s Plays for the Poor Theatre. Democratising theatre – which Brenton argued “is part of our daily discourse with each other” – these productions set out to “turn ‘bad theatrical conditions’ to advantage” and show that “playwrights and performers will not be silenced” by funding cuts. However, The Saliva Milkshake was written for television, appearing in the Centre Play anthology, after the series for which it was commissioned, the late night, low budget ‘fringe’ strand, The Eleventh Hour (BBC2) was cut due to the 10:30 pm television shut down during the miners’ strike. The play’s theatre debut came six months later, at Soho Poly Lunchtime Theatre in June 1975. Like the moment that gives the play its title, studio space moves fluidly between the physical and abstract, matching characteristic Brenton concerns with ideology and fantasy, politics and ambiguity, spoken and unspoken/unheard language. The play’s concern with theory and practice is both of its moment – examining post-1968 radicalism – and makes for an economical adaptation of its source book, Joseph Conrad’s Under Western Eyes (1911). Anonymous, ‘Is it all fair, when we ask the questions?’, Radio Times, 9-15 May 1981. Anonymous, ‘BBC plays – compiling a mix, advancing techniques’, Stage and Television Today, 16 September 1982. Brenton, Howard, Plays for the Poor Theatre, Methuen, 1980. Conrad, Joseph, Under Western Eyes, Methuen, 1911. Kelly, Richard (editor), Alan Clarke, Faber, 1998. Mitchell, Tony (compiler), File on Brenton, Methuen, 1987. Rolinson, Dave, Alan Clarke, Manchester University Press, 2005. 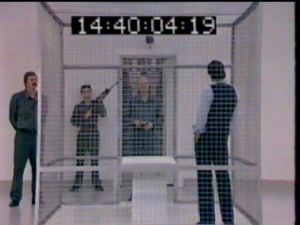 Schlesinger, Philip, Graham Murdock, Philip Elliott, Televising ‘Terrorism’: Political Violence in Popular Culture, Comedia, 1983. Watson, Peter, War on the Mind: the Military Uses and Abuses of Psychology, Basic, 1978. Wheeler, David, ‘Tough going’, The Listener, 21 May 1981. This entry was posted in BFI Screening Series, Single Plays. Bookmark the permalink. I’m thoroughly enjoying reliving my studio drama camera past, with this series, and I’m looking forward to trying to remember which parts of “Desert of Lies” I shot. Plays, such as you have been showing, would generally have been rehearsed and recorded in the ratio of 30 minutes of screen time per day. Camera rehearsal, would start at 10:30 and continue with a break for lunch until 18:00. Recording would begin at 19:30 and finish at 22:00. This would be the first time and only time the technical crews (other than the craft leaders – Cameras, Sound, Lighting) would have seen any of the action. Persistence of memory and the ability to identically repeat the sequence of shot requirements which may have been rehearsed up to 9 hours previously, and to adapt to any changes which may have been mentioned at director’s notes (given about 15 minutes before recording and therefore not rehearsed! ), were paramount skills. Multi-camera studio drama was a total team effort. Adrenalin fuelled! Many thanks for sharing this David, and I hope you enjoy the screening and panel tomorrow. Hope to chat to you then.